Black Rat Press will be exhibiting at the London Art Fair (Jan 13-18) where they will be showing works by Swoon, Matt Small, Lucas Price, Asha Zero, Brian Adam Douglas, D*Face and Nick Walker.Â Also garnering significant interest is the new print “The Empires’s State” by Nick Walker from his “The Morning After” series.Â The release will on January 13th (6 pm) at the fair, but there will also be an online option for those who are overseas and can’t make it. 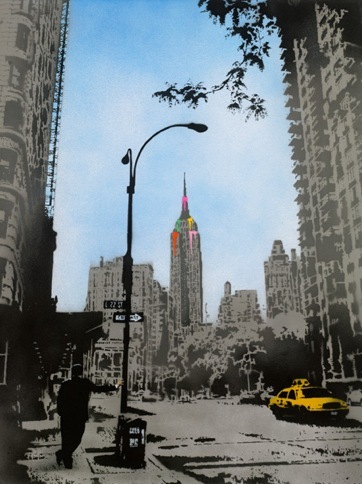 As you know we will are exhibiting at next weeks London Art Fair where we will be releasing the Nick Walker Empire State edition from his Morning After series. Due to the demand for this print and the overwhelming number of enquiries we thought we should send out further information about how the release will work. The preview evening is on Tuesday 13th January from 6pm onwards and tickets can be bought on the door. For those intending to arrive early and queue (whether you already have a ticket or are planning to purchase one on the night) we would like to make you aware that this is not just a Black Rat event and therefore we want to cause minimum inconvenience to the fair organizers and other exhibitors. For this reason a member of Black Rat staff will be outside the Business Design Centre during the afternoon to ensure that there is a fair system in place for those queuing and that any queue is in a place that will cause minimum disruption. We will be using some sort of ticket system to guarantee those in the queue have the opportunity to buy the print so there will be no need to rush to our stand when the doors open at 6pm. This should also make sure those already with a preview ticket will not be able to purchase a print ahead of someone who needs to buy one on the night. Tickets are Â£25 and all proceeds go to the Art Fund. Finally there is no point arriving at the design centre before the afternoon of the 13th as the gates will be closed before then and security will not allow people to wait outside. Plus its January and really really cold. A small number of the edition will be held back for collectors from overseas. Anyone from overseas interested in buying the new Nick Walker should email [email protected] with their name and postal address and we will work out some sort of lottery/tombola type system to allocate the available prints. We will email those who are successful on Tuesday 20th January. If you do not receive an email on that day then you should assume you have not been successful. Categories: Art, Releases, Shows & Events, Street & Urban Art. Tags: Asha Zero, Brian Adam Douglas, D*face, Lucas Price, Matt Small, Nick Walker, Prints, Releases, Shows & Events, Street & Urban Art, Swoon.